One dar night, the phone rang, rousing Dracula's wife, Elizabeth, from a deep sleep. It was her husband, who told her terrible news: The fierce and mighty Count Vargosi had broken free! Everyone thought this was impossible! Count Vargosi was bound in silver chains and locked in a crypt. Fearing his resurrection, the most powerful witches in the world had cast the Spell of Eternal Sleep on him! Holy garlic! Vargosi is up to his old ways! His evil deeds will damage the reputation of every vampire, and the hunters will start coming after us again! All we know is Count Vargosi is racing to the Moon Well to restore his strength. He must be stopped. This is a bad time for me to be away! You'll have to look for Count Vargosi on your own. I'm leaving today. We'll meet along the way. And Elizabeth, take Viaddy with you. He's good in the wilderness and will be very useful. I'll feel better knowing he's with you. 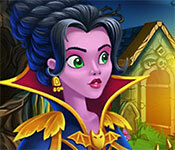 Click to start Incredible Dracula: Vargosi Returns Free Download.